Image and text by Lindsey Johnson for Design Mom. 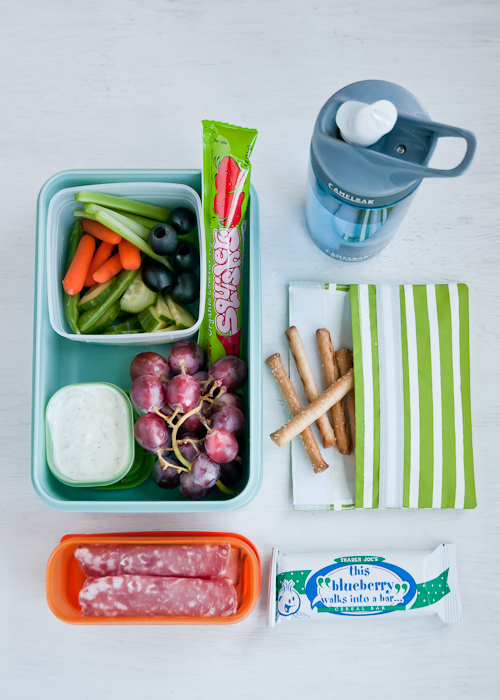 For Menu #13 of our Lunch Box Series, we’re doing another snack-y lunch because they are so popular! This time I’ve created a mini-relish tray (minus pickles) with a homemade Ranch dip (Greek yogurt and seasoning mix). Instead of cheese, I’ve included a squeezable yogurt. – You can freeze the yogurt so it stays extra cold, but my kids said it stays cold enough with the ice pack. Camelbak water bottles are the best! And I’m not craving pretzels like you wouldn’t believe. i adore this lunch menu series! so different! clever and fresh, and i love the fact that the actual lunch is not just a product you try to advertise as we often see in other blogs, but really something to eat!! cool and enjoyable!